This year is shaping up to be a good one for kayaking and canoeing. In northeast Ohio, we have had plenty of rainfall to help keep water levels in our streams high. Here in Columbiana County, that means plenty of opportunities to kayak and canoe Little Beaver Creek. This designated State Wild & Scenic River and National Scenic River is one of the best in the state for observing wildlife and the pristine habitat in which they live. So far this year, with the water level being high, it has allowed me to take more than a dozen kayaking trips down Little Beaver Creek with family and friends. On each one of these trips, wildlife was present from the launching of the kayaks, to the take-out point. On our first trip, the Queensnake and Common Watersnake were the first wildlife we encountered. These snakes were often seen basking on fallen trees, large rocks or low branches overhanging the water, which surprised some kayakers. Another species we encountered repeatedly was the Common Merganser, always staying thirty feet or so in front of us. We saw numerous species of birds such as Yellow Warbler, Great Crested Flycatcher, Pileated Woodpecker and Red-tailed Hawk. On one float we observed a Wood Duck watching over her young, as a four foot Black Ratsnake watched no more than thirty feet away. Whitetail deer, red foxes, raccoons and squirrels were also common sights on many trips. One of the most exciting days was when we encountered two different Great Blue Heron rookeries on the Middle Fork of Little Beaver Creek. For many of us on the trip, this was the first time ever seeing a rookery. 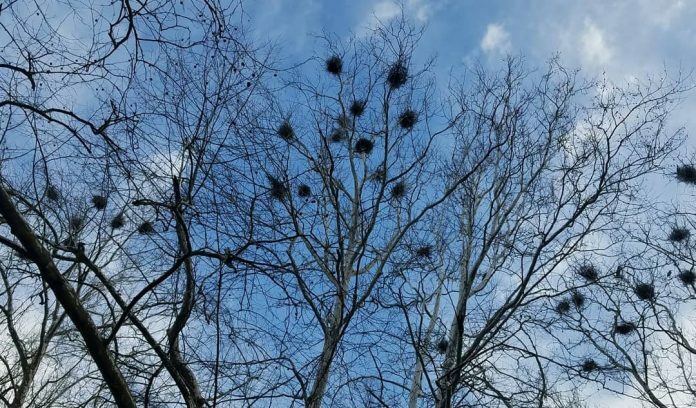 These heron rookeries are colonies of nests, built out of large sticks, high in the tops of big trees, such as Sycamores that line the stream banks. The first rookery north of Lisbon, contained more than 50 nests and the second, just south of Elkton, contained more than 30 nests. It was an amazing sight to paddle around the bend of the stream and see more than 50 large nests, high in the trees, and Great Blue Herons flying everywhere. There is just something relaxing about floating down a stream, and observing the wildlife and how they interact with each other. It really makes you appreciate all the conservation that takes place in order to protect wildlife and their habitat. The efforts of others are truly realized when you are kayaking or canoeing down a stream, and you see the clean water, an abundance of wildlife and the pristine stream corridor. You know at that moment that the conservation of our natural resources, protection of our wildlife and their habitat, is something very important that should not be overlooked. So the next chance you get, plan a float trip down your local stream, and you will understand exactly what I’m talking about.